Have you ever dreamt of entering a design competition like Project Runway? 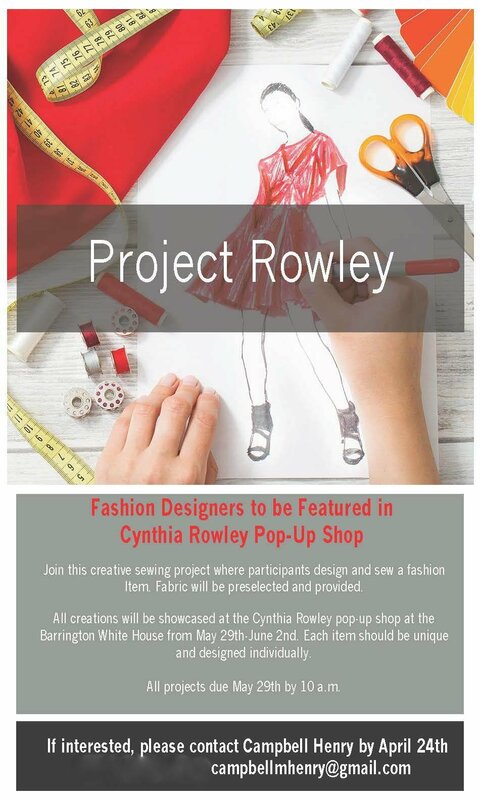 Unleash your artistic creativity with this one-of-a-kind opportunity that will be seen by Cynthia Rowley. Cynthia has appeared on America’s Next Top Model, Project Runway, David Letterman, The View, and Oprah, among others. Since launching her first collection in the early 1980’s, Cynthia has established herself as an award-winning designer expanding her brand to include apparel, shoes, handbags, eyewear, fitness gear, and most recently a surfer line. Join this innovative sewing project where participants design and sew a fashion item. Fabric will be preselected and provided. All creations will be showcased at the Cynthia Rowley Pop-Up Shop at Barrington’s White House from May 29 – June 2. Each item should per unique and designed individually. All projects are due May 29th by 10:00a.m. Fabrics may be picked up from Barrington’s White House (BWH) in the BWH Volunteer Office, 145 West Main Street, Barrington, Illinois, 2nd floor, Monday-Friday, 9 a.m. – 5 p.m. Participants are asked to pay a $10 fee (cash or check only) at the time of pick up, in order to help defray the cost of the fabric. All entrants will be featured in a group photograph with Cynthia Rowley on Saturday afternoon, June 2nd. If you would like more information please visit the address above or email Campbell Henry at campbellmhenry@gmail.com. All Cynthia Rowley events may be seen here.